Rain? In Venice? Not in this economy! They’re sinking as it is, I think any more water might just tip things over the edge for them. But, I suppose the rain has its charms. Who wouldn’t want to be in a gondola with your lover and the third-wheel rowing it as all your striped shirts and neckerchiefs get sopping wet? Sounds like one hell of a date to me! Venetian Rain is a 5-reel, 40-payline video slot powered by software from Belatra Games. 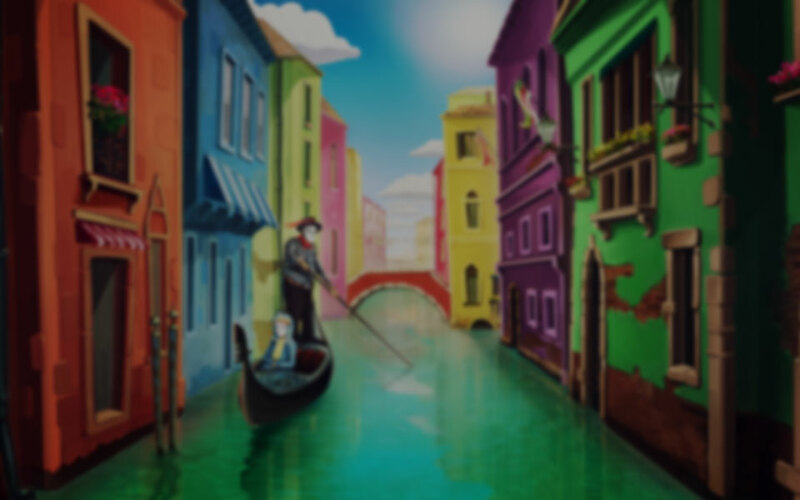 This slot is all about the city of water, Venice. Symbols include a blue mask, pink mask, yellow mask, a gondola, a flower box, a hat, a striped shirt, a lantern, and the four playing card symbols (diamonds, spades, hearts, and clubs). The Scatter is represented by big ol’ stormy rain clouds, while “WILD” acts as the, ahem, Wild. The controls are pretty user-friendly, but let’s run through them quickly. From left to right expect Menu, Credit, Lines, Bet, Win Display, Max Bet, Start, and Auto Play. So, what features can you expect from Venetian Rain? Wild: Substitutes for all features except for the Scatter. Free Spins: Landing 3 or more Scatters will trigger a minimum of 5 Free Spins, and is re-triggerable up to a max of 105 spins. During this feature, the water levels will rise, and multiplier will increase (until max x5) if a coin falls on the Thunder side. Venetian Rain has a gamble feature and a double up feature. Gamble: The gamble feature is a simple way for you to multiply each round's wins by either x2 or x4. All you have to do is guess whether the card will be red or black. Guess correctly and, congrats, you win but get it wrong, and you’ll be sent back to the base game empty-handed and broken-hearted. Double Up: This feature will appear after each winning round, and allows you to either double your win or lost it. You’ll have to choose a card, out of four cards, and you’ll win should it be higher than the dealer’s. If not, prepare for some real disappointment. Honestly, Belatra really does a fantastic job of showing off the city of Venice in this slot. The graphics are kind of cutesy, but very well done, and the soundtrack will have you dreaming about gondola rides. It’s also available on any device. Venetian Rain is a medium volatility slot, with a max win of 5x your original stake or approx. 100,000 coins. Venetian Rain is something wonderful. The features are fantastic, and can really help up your winnings, and the payouts are pretty damn substantial. Come for the cheesy gondolas, and stay for the ride of your life.